Zoning is the oldest approach. 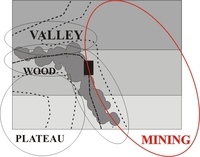 Kings and noblemen, who did not wish to be troubled by the negative sideï¾­effects of mineral extraction, kept mining areas out of sight, preferably in what Agricola saw as 'unproductive mountains'. The policy can be used for ubiquitous minerals but not for scarce minerals, which must be dug where they are found. It is applicable to building stones, road metal, limestone and chalk for cement manufacture, clay for brickï¾­making, sand and gravel for building, but not to coal, ironstone, gemstones, mineral sands, special clays or metalliferous ores generally.